They say that imitation is the sincerest form of flattery. When your favorite celebrity is seen carrying the ultimate It bag that perfectly compliments her immaculately styled ensemble, you want nothing more than to own the look. At cost-prohibitive designer prices, this feeling of desire is hard to fulfill. Furthermore, without a posse of stylists, and a celebrity bankroll, many of us are left to comb the internet for inspiration. Without the type of budget that celebrities work with, it’s hard to afford celebrity style. That’s why fashionstas are now turning to designer-inspired accessories. These designer-inspired accessories look and feel just like the original, but at a fraction of the cost.We are here to help! At Bag Inc., we’ve taken the guess work out of celebrity style by providing awesome designer inspired pieces, and photos of celebrities with the items for inspiration. We love seeing Reese Witherspoon carrying this Alexander Wang Rocco Mini Duffle. 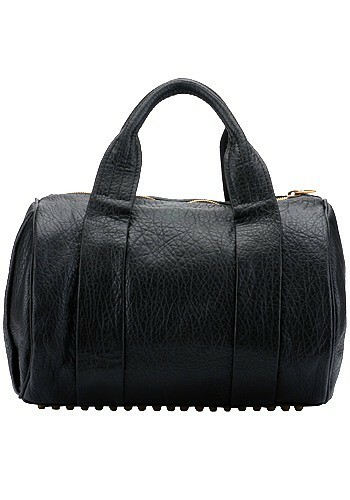 It’s hard to imitate her adorable tomboy style because the AW Mini Duffle has sold out everywhere. However, you can snag our gorgeous version of this bag here. I’m really need to win this bag in black!